This small gallery demonstrates some of Yar's features. 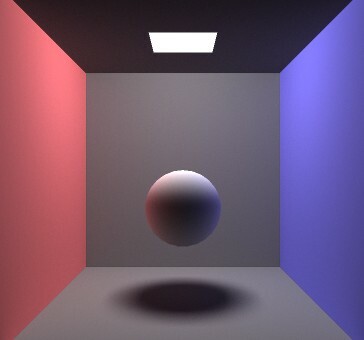 The Yar logo demonstrates soft shadows and color bleeding with a Monte Carlo raytracing image. The floor and ceiling are both somewhat reflective. The floor receives direct light from above, but all of the light on the ceiling is reflected from the rest of the scene. 1,000 rays per pixel were used for this image. This image shows a scene with pure diffuse lighting. The sides of the white sphere are being tinted by the colored light reflecting from the walls. This image shows an open scene. Notice how the tops of the letters have picked up a blue tinge from the reflecting background color. 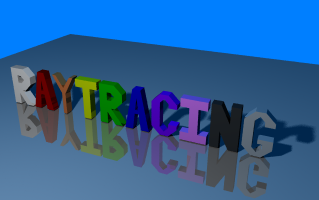 Jittering was used on this image, with 100 rays per pixel to get the soft shadows behind the letters.